California top state pot regulator Lori Ajax addresses an industry group meeting in Long Beach, Calif., Thursday, Sept. 28, 2017. California's emerging marijuana industry is being rattled by an array of unknowns, as the state races to issue its first licenses to grow and sell legal recreational pot on Jan. 1. Ajax says she doesn't know how many operators will come forward to seek licenses. Proposition 64, which legalized recreational pot use for adults, takes effect next year. LONG BEACH, CALIF. (AP, SEPTEMBER 29, 2017) — In about three months, recreational marijuana sales will kick off in California, yet no one knows exactly how the pot economy will work. It could take until late November for the state to issue regulations that will govern the new marketplace. 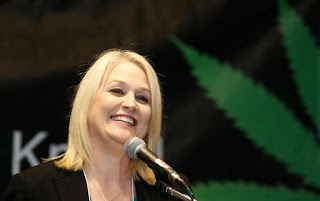 "We all have anxiety," top state marijuana regulator Lori Ajax told an industry group Thursday. "It's not going to be perfect." Last year, California voters approved Proposition 64, which legalized recreational pot sales to adults in the nation's most populous state. The law takes effect in 2018, when newly legalized recreational sales will be merged with the state's two-decade-old medical marijuana market. Ajax heard a range of concerns from operators and consultants who are trying to maneuver through a maze of new rules that will dictate where pot can be grown, how it's tested, distributed, taxed and sold. Ajax said she doesn't know how many operators will come forward to seek licenses. It's a critical question, since the state's legitimate pot sales could be undercut by illegal operators. Speaking in Long Beach, Ajax said the state is preparing to issue temporary licenses for growers, sellers and manufacturers on Jan. 1. It expects that businesses that receive licenses will only work with others that hold them. But that has alarmed operators who wonder what will happen if their supplier, for example, decides not to join the new system. "You would have to shut your doors until your supplier can come online," industry consultant Jackie McGowan said, calling that prospect potentially "disastrous" for the young industry. Ajax appeared to ease concerns that the state would move quickly on enforcement against operations without licenses. If the state is aware a business has applied for a license, "I don't want you to have anxiety that we're out there and we're going to be enforcing everything right away," Ajax said. In addition, it appears San Francisco will not be ready for legal sales in January — and perhaps not for months. The state will begin by issuing temporary licenses, good for four months. But those could be extended, if necessary. By legalizing recreational pot, California is attempting to transform its vast marijuana black market into the nation's biggest legal pot economy, valued at $7 billion. Ajax also heard concerns about the possibility that cottage-industry growers could be overrun by huge operators, backed by Wall Street dollars. "Capitalism is messed up at best," said Justin Calvino, who sits on the board of the California Growers Association, an industry group. He warned that smaller growers struggling to survive could be shuttered "when you have licenses being issued to people with the most money, or to people that have the most lobbyists or the best marketing." Ajax got a round of applause when she said her agency would be open on Jan. 1 to begin issuing licenses. "We are probably going to do regular business hours," she said. "Even though it's a holiday we are coming in and we are going to get it done because it's important to all of us that we are successful in this."